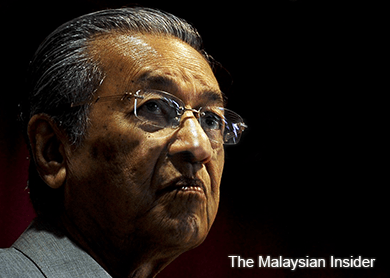 (May 18): Citing "too much power", former prime minister Tun Dr Mahathir Mohamad today suggested that the authority given to the prime minister be reduced. Speaking during the launch of a new book entailing his diplomatic letters to other world leaders, Dr Mahathir, who served for 22 years as Malaysia's fourth prime minister, said there is "too much power" for whoever is helming the post. He said that no one is qualified to become the next prime minister, when the question was posed to him by a member of the audience. "There is no one. Because the prime minister has too much power. "Maybe there needs to be another Cabinet, that is not appointed by him, who must have a say in whatever he does. "If he wants to borrow money, he must seek their approval." Dr Mahathir is currently calling for the resignation of Prime Minister Datuk Seri Najib Razak, after declaring that Najib has failed as a leader. In an article posted on his blog last month, Dr Mahathir had said that his criticisms against Najib was simply because he wanted to see the party win in the 14th general election. He also raised questions on the poor handling of issues such as 1MDB and the murder of Mongolian model Altantuya Shaariibuu. Dr Mahathir today claimed that instructions were also given not to allow university students to attend his talk. "Now, instructions have been given, that when I give a speech, no university students should come and sit and listen," Dr Mahathir claimed. "As you can see, the PM can exceed or abuse his power now," he said. Meanwhile, he added that there is some "virtue" in leaders serving for a long time, to allow continuity in their plans. "Nobody can change or develop the country overnight," he added.